We may be a minority, but there are some of us who have the merit, as well as the guts, confidence and courage to take the path of guru devotion as our utmost essential path. I was taught by my master that the core of this path is remembering the guru. Contrary to many people’s assumption that the guru is some kind of external entity that dictates your life, if I have understood correctly, in the Vajrayana the guru is the path. Mindfulness is the heart of the practice of all of the Buddha’s vehicles, whether you are in the Shravakayana, the Mahayana or the Bodhisattvayana. There are millions of methods to enhance this mindfulness, remind us of this mindfulness, and invoke this mindfulness. In the Vajrayana, we have the guru as the reminder, and also what we remember. The great Jigme Lingpa said that when a yogi pursues the path of enlightenment, he could spend years and years accumulating merit through all kinds of methods, but meditation that lasts the duration of a cup of tea is more penetrating to this solid hard wrapping of ours. Spending years and years in meditation is excellent, but it is nothing compared to a single moment of remembering the guru. Even just remembering the guru’s name will dispel confusion and accumulate countless oceans of merit. Chögyam Trungpa Rinpoche was a pioneer and igniter of Buddhadharma in the West. Without a doubt, that must have been a challenging task. What Rinpoche has achieved would usually take at least three generations—first introducing, then maturing, and finally stirring things up. 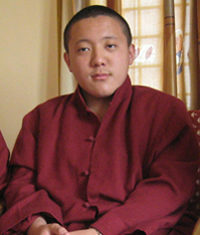 Rinpoche managed to do all of this in less than twenty years! Western disciples might appreciate that what Chögyam Trungpa Rinpoche has done takes great talent. However, as a person from a similar background, I cannot even begin to fathom the amazing courage that he had—this may be more difficult for others to understand. One of the main challenges in the world today is the inability to understand others’ points of view, cultures and traditions, and therefore being unable to communicate effectively. Rinpoche not only managed to understand the culture and thinking of the West, but was then able to interpret Buddhist wisdom, coming up with everything from terms to symbolism and disciplines. He created and communicated all of this incredibly effectively, from the smallest terms to a whole new culture and kingdom, while never diluting the fundamental Buddhist view. To this day, I think many of us are struggling to teach Buddhism beyond Tibet, beyond the East. We owe him a lot for opening that world. Twenty years after the passing of Chögyam Trungpa Rinpoche into the parinirvana, I can confidently say as an independent observer that although Rinpoche’s students have gone through lots of bumpy roads at times and lots of blissful roads at other times, they have kept his vision, his atmosphere, his smell, and his presence. From my deluded perception I can only interpret that this must be due to their love and devotion.